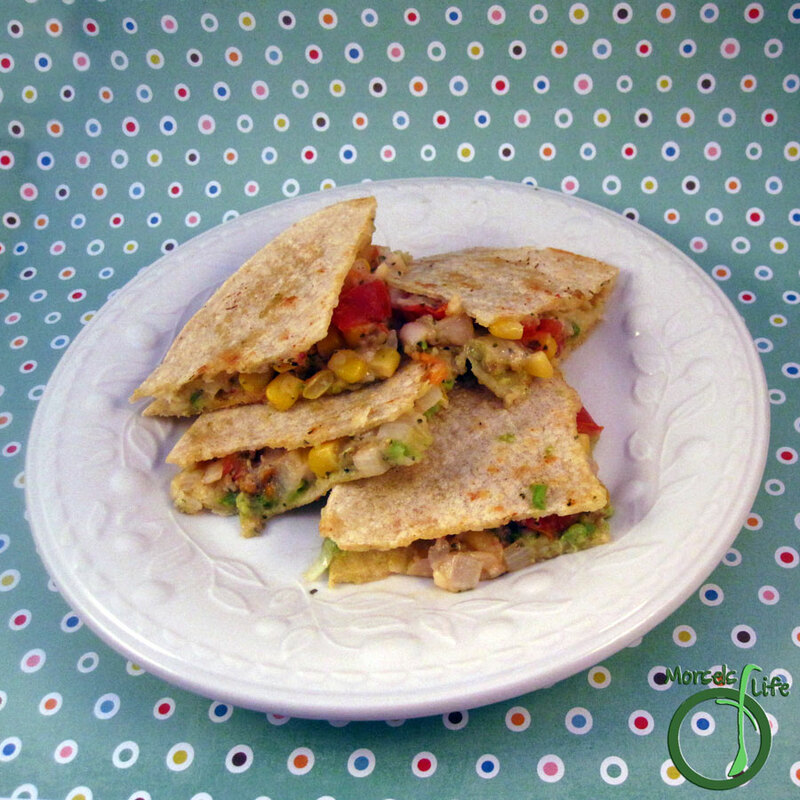 A cheesy and creamy avocado bean quesadilla filled with corn, pico de gallo, and a bit of onion. Well, it's time for the Surprise Recipe Swap! Every month, we're assigned another blog to make a recipe from, and this month, I got Hungry Little Girl. Looking through the recipes, I had a hard time picking a recipe. Finally, I selected the Avocado Bean Quesadillas. I'd never put salsa in a quesadilla before, so I wanted to give it a try. I did make a few changes to the recipe based on what I had and our preferences. I used corn tortillas in "fajita" size, or 6 inch diameter. (apparently "soft taco" size is an 8 inch diameter and "burrito" size is a 10 inch diameter. I never knew the sizes were standardized across brands!) I also used white beans instead of black, half an onion instead of a whole one since I thought it'd be too much, especially since I used pico de gallo for salsa. And finally, since I hate shredding cheese, I just sliced some cheese and crumbled it as I used it. (Insert your own joke about cutting the cheese here. :P) I found the filling enough for way more than the 2 quesadillas Jutta made. In fact, the amount of filling was enough for six quesadillas, although I did use the 6 inch diameter "fajita" sized tortillas instead of the 8 inch diameter "soft taco" tortillas. I cooked two quesadillas on the stovetop, and it always seems to take so long, so I cooked up the other four in the oven. It's my preferred method, especially for larger batches. 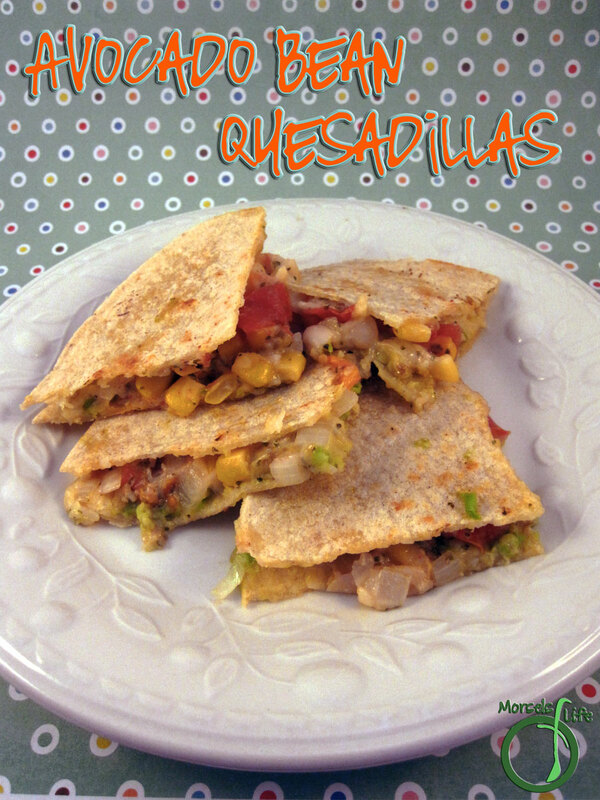 How do you like to cook your quesadillas? 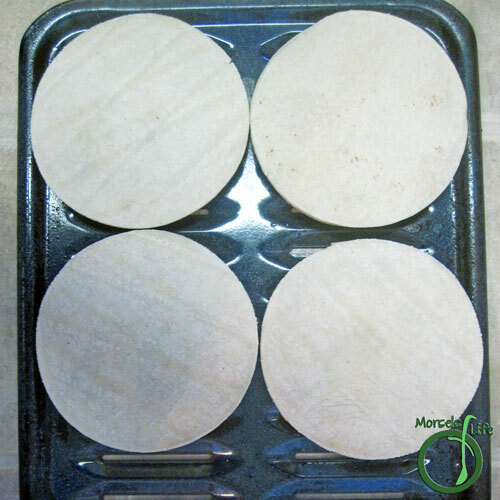 12 tortillas I used 6 inch diameter corn tortillas. 198 grams 1 cup beans, cooked About 1/3 cup uncooked beans. 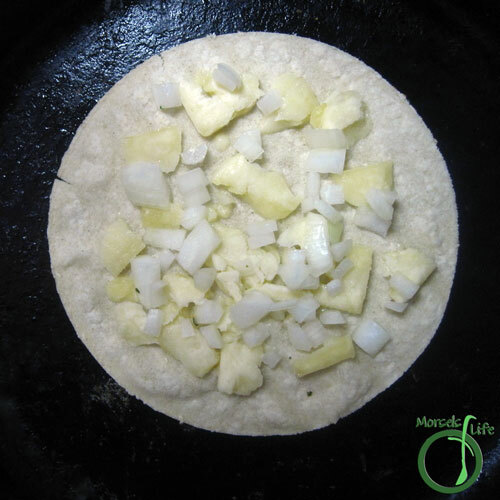 Heat tortilla on a pan or skillet and place approximately 1/2 ounce cheese and 2 teaspoons onion on it. 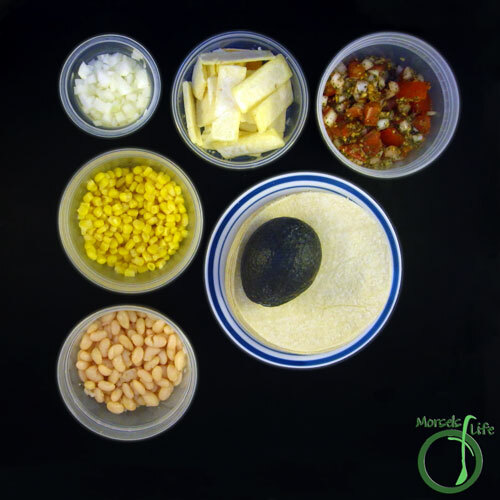 Place 2 heaping tablespoons each of the pico, beans, and corn onto tortillas. Top with approximately 1/2 ounces cheese and avocado slices. Place other tortilla on top, and flip to brown other side. Alternatively, place half the tortillas on a baking tray (preferably one with openings) and top with fillings. Place other half of the tortillas on top and bake at 350F for about 15 minutes or cheese melted. 2. PHeat tortilla on a pan or skillet and place approximately 1/2 ounce cheese and 2 teaspoons onion on it. 3. 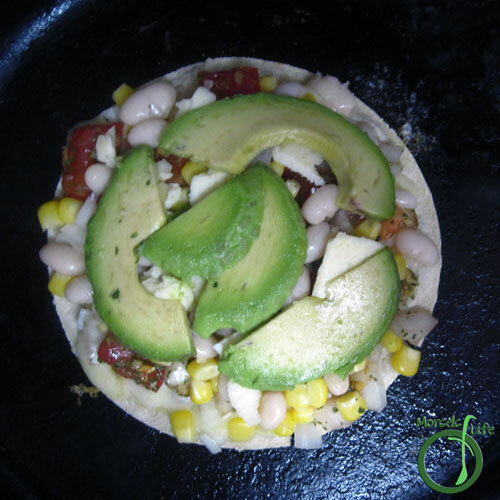 Place 2 heaping tablespoons each of the pico, beans, and corn onto tortillas. Top with approximately 1/2 ounces cheese and avocado slices. Place other tortilla on top, and flip to brown other side. 4. 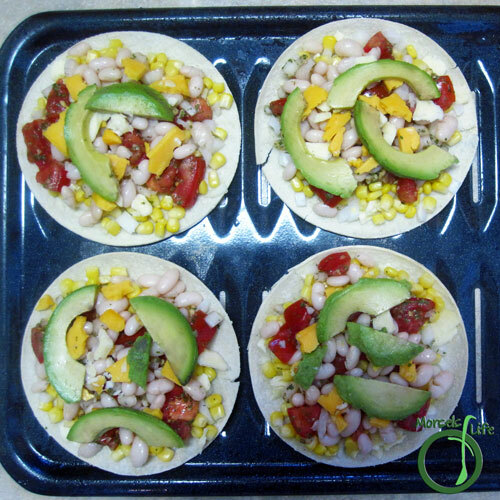 Alternatively, place half the tortillas on a baking tray (preferably one with openings) and top with fillings. 5. Place other half of the tortillas on top and bake at 350F for about 15 minutes or cheese melted. These look really yummy! I think we will make on our little vacation with family next week! Thanks! Oh your Quesadillas look so good! Thanks! Glad to hear you enjoyed the Nutella Coconut Popsicles. :) Thanks for stopping by! I love Mexican food and these look simply delicious! Great pick! Oh, I LOVE the look of these! I'll eat avocado in anything!